I’ve been really into making soups lately…probably due to the fact the weather has turned chilly fast and there is nothing like a steaming bowl of creamy soup to warm the soul after a long day. I made the following recipe last night, amidst all of the ghosts, witches, and Justin Beiber look-alikes coming to our door. It was a great meal for a “night of chaos” as I could keep it warm on the stove for hours until we were ready to eat when the doorbell finally stopped ringing. 1) Melt butter in a large pot over medium heat. Once melted, stir in leeks and onions and cook until softened, approx. 10 minutes. Add potato, squash, carrots, apple, and chicken stock and bring to a boil. Reduce heat to med-low and cover, simmering until vegetables are soft, about 20 minutes. 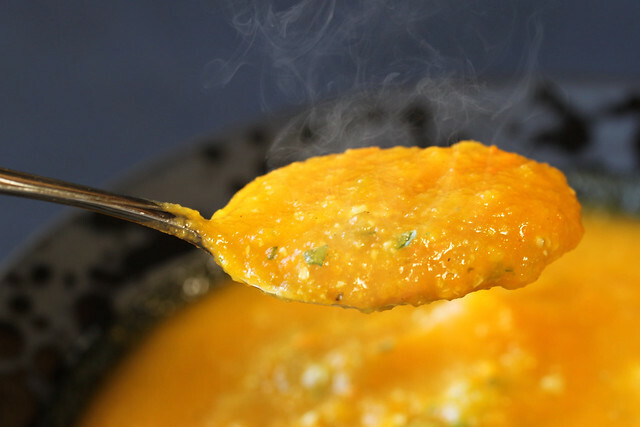 2) Carefully puree the soup in small batches using a blender or use a stock blender and puree it right in the pot. Once pureed, return to pot and stir in cream (and wine if desired). Season with nutmeg, salt, and pepper, allowing to simmer gentle for at least 5 minutes. Serve in bowls, garnished with green onions. I think this may be a Halloween tradition at our house! Previous postPlant a Memory Next postWho Knew?